Commuting to work in Central Florida is a circus. Just consider James Rawlins, who celebrated his 75th birthday Tuesday by riding to his office on a unicycle. "At 75, I had to do something special," said Rawlins, a dentist who has been in practice for more than 30 years on State Road 434. 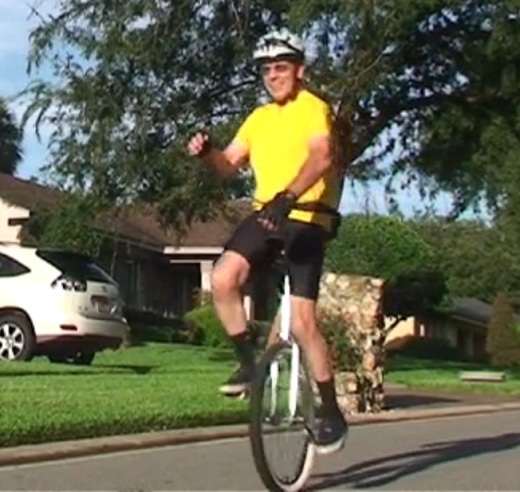 Around 8 a.m. Tuesday, Rawlins hopped on his silver unicycle and began the 5.1-mile journey from his home in Maitland to his office in Longwood. Wearing a bright yellow shirt, black spandex shorts and bike helmet, Rawlins coasted down the driveway and pedaled through his quiet suburban neighborhood about 5 mph. Avoiding cars — both parked and moving — Rawlins made his way toward Oranole Road and then onto Maitland Avenue. "He likes to do different things," said his wife of 40 years, Nicole Rawlins. "He love challenges." From X-rays to exams, a range of free dental services will be available Friday and Saturday at Cal Expo's Buildings C and D.
A cadre of volunteering dentists and assistants will throw open the doors at 5:30 a.m. to early risers lining up outside 1600 Exposition Blvd. They're hoping to see a virtual flood of up to 1,500 people arriving to obtain free dental and oral health care services during the two days. Volunteers will transform Cal Expo's buildings into big-tent-style health care spaces complete with rows and rows of dental chairs, oral care equipment and special lighting. An estimated 10 million Californians, or about 30 percent of the state's population, experience barriers to oral care, mainly affordability, the California Dental Association says. The CDA, which is organizing the two-day free clinic called CDA Cares with the CDA Foundation, held a similar event in May in Modesto. In a settlement reached with the U.S. Federal Trade Commission (FTC), Brain-Pad and its president, Joseph Manzo, have been barred from making unsupported claims that the company's mouthguards reduce the risk of concussions from lower jaw impacts, reduce the risk of concussions generally, or have been clinically proven to do either. The settlement also prohibits Brain-Pad and Manzo from misrepresenting the health benefits of any mouthguard or other athletic equipment designed to protect the brain from injury. According to the FTC, Brain-Pad and Manzo made their claims about the mouthguards' concussion-protecting qualities on product packaging and in Internet and print advertisements. On packaging for the Brain-Pad Pro-Plus Junior mouthguard, the defendants claimed the device "creates new brain safety space!" and "Reduces Risk of Concussions! From Lower Jaw Impacts." Similarly, packaging for the adult-size Brain-Pad Double Mouth Guard proclaims that the device, "Reduces risk of CONCUSSIONS! Protects Upper AND Lower Teeth!" Swiss dental implant maker Nobel Biocare said it expected a modest decline in the global dental implant market for the rest of the year, as it posted second-quarter profit in line with expectations. In the first half of 2012, markets developed less favourably than anticipated at the beginning of the year," the Zurich-based company said in a statement. "For the remainder of 2012, Nobel Biocare anticipates a continuation of the challenging economic circumstances in many countries and expects the market to develop at the same pace as in the first half." Net profit in the second quarter fell 12 percent to 14 million euros. Analysts in a Reuters poll had forecast sales to fall 14.5 percent to 13.6 million euros.